Fluke Corporation is the world leader in the manufacture, distribution and service of electronic Test tools and software. Since its founding in 1948, Fluke has helped define and grow a unique technology market, providing testing and troubleshooting capabilities that have grown to mission critical status in manufacturing and service industries. From industrial electronic installation, maintenance and service, to precision measurement and quality control, Fluke tools help keep business and industry around the globe up and running. 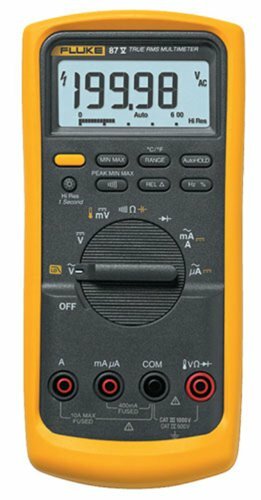 The Fluke 87-V Digital Multimeter is a versatile True-RMS meter that's perfect for professional or around-the-house use. This meter offers auto and manual ranging for maximum flexibility, and it also offers an annual bar graph for quick-changing or unstable signals. Classically designed, the Fluke 87-V has a removable holster with built-in probe and test-lead storage. For added convenience, it arrives ready to go with TL75 test leads and a nine-volt battery. Designed for maximum productivity, the Fluke 87-V has more problem solving power, safety, convenience, and impact protection than the previous 80 Series models. 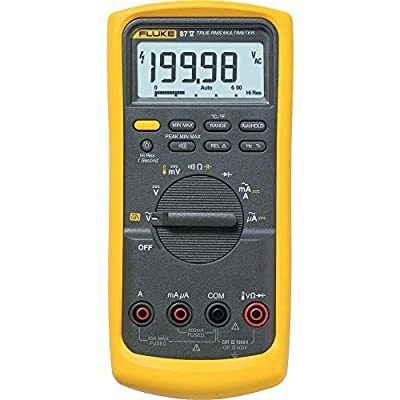 This multimeter offers improved measurement functions, accuracy, and resolution, as well as trouble-shooting features to solve problems with motor drives, in-plant automation, power distribution, and electro-mechanical equipment. 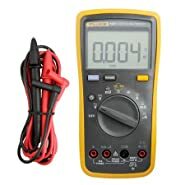 This unique multimeter provides both auto and manual ranging for optimum flexibility. And it's chock-full of helpful functions for accurate voltage and frequency measurements, even on adjustable-speed motor drives and other noisy equipment. The Fluke 87-V also boasts a built-in thermometer that conveniently allows you to take temperature readings without having to use a separate instrument--no more carrying a thermometer to take readings inside a refrigerator or air conditioning unit. When used with ToolPak, a convenient magnetic hanger (sold separately), the Fluke 87-V can be set up and viewed hands free. 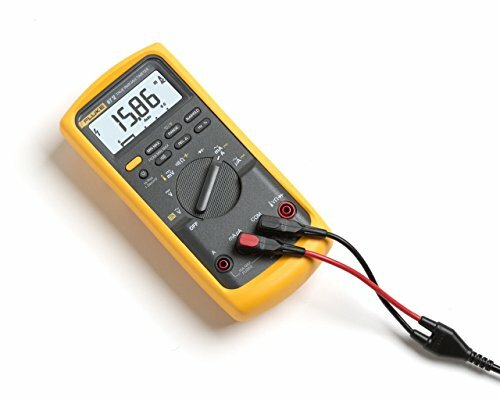 Incredibly responsive and reliable, the Fluke 87-V is accurate to 0.05% DC. Also, True-RMS AC voltage and current provide accurate measurements on non-linear signals. Additionally, a selectable filter ensures accurate voltage, while an input alert provides an audible warning against incorrect use of the input jacks. The Fluke 87-V measures up to 0 A, up to 20 A for 30 seconds, and 1,000-volt AC and DC. Also, it features an analog bar graph that allows for measurement of quick-changing or unstable signals. What's more, this meter measures frequency to 200 kHz, as well as resistance, continuity, and diode test. The Fluke records Min/Max/Average and has a Min/Max alert that automatically captures variations. The Relative mode removes test lead interference from low-ohms measurements. 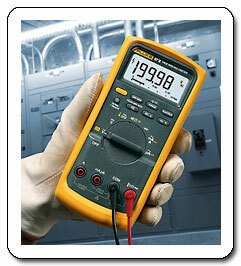 The Fluke 87-V comes equipped with a large, backlit display that shows easy-read digits. An improved selectable sleep mode helps increase the life of the battery, while an access door makes for fast battery changes without breaking the calibration seal. The Fluke 87-V is also safe--it's independently tested to comply with the second edition of ANSI/ISA S82.01 and EN61010-1. Also, CAT IV 600V/CAT III 1000V rated, this handy meter can withstand impulses in excess of 8,000 volts and can reduce risks related to surges and spikes. Additionally, its tightly sealed design helps protect against damage, even when the unit is dropped. The Fluke 87-V is backed by a lifetime warranty. 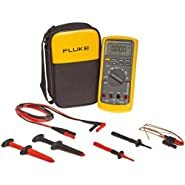 Fluke 87-V; TL75 test leads; AC72 alligator clips; holster; nine-volt battery (installed); Getting Started manual; Manual Fully downloadable off of the Fluke website; and 80BK temperature probe.